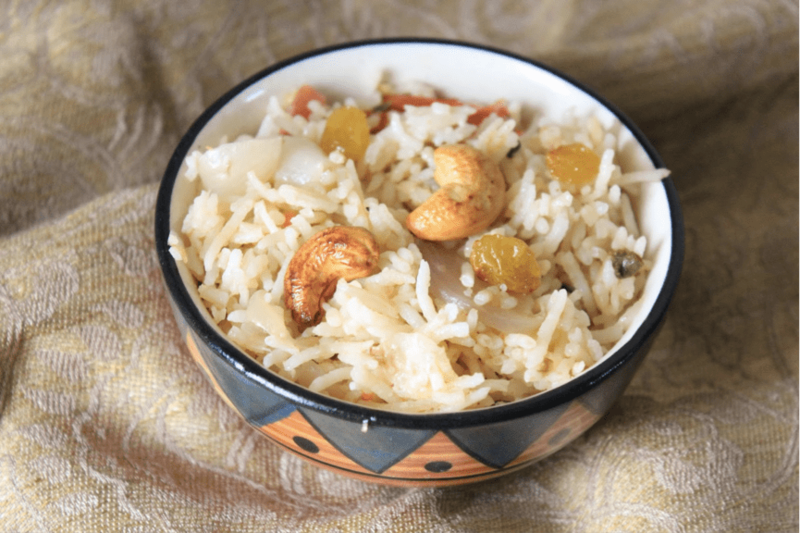 This midly spiced and wonderfully flavoured rice is one of my personal favourites. This is one of the dishes i learnt from my MIL. It serves best with pakoda kurma – which is basically lentil fritters in a onion tomato gravy. Wash the rice multiple times till the water comes clear. Soak the rice in water for about 30 minutes. Add fennel seeds and warm water to freshly grated coconut. Grind it finely and then extract the coconut milk. Pour oil in hot pan and add the whole spices (cardamom, cinnamon, bayleaf & cloves). Add the onions and saute it till they are translucent. Now add the ginger-garlic-green chilly paste and saute it till the raw smell of ginger garlic paste disappears. At this stage add the tomatoes and cook it till the tomatoes are soft. Now add the mint and coriander leaves and fry these for about a minute. Add the drained rice and saute it till the moisture from the rice dries up. Finally add the coconut milk and cover the pan and slow cook the rice for ~ 15 minutes. Serve hot with any spicy indian curry! I used one half of a large coconut to make the coconut milk. i got 2 cups of thick first pressed milk and 2 cups of second pressed milk.